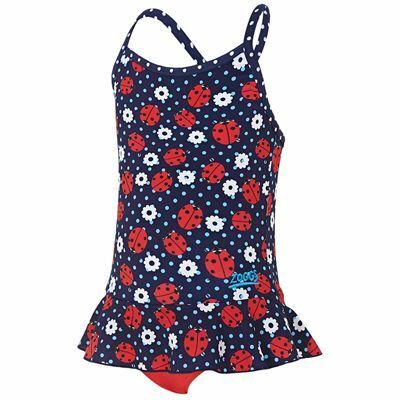 A perfect choice for your little swimmer who wants to stand out when having fun in the pool or at the beach, the Zoggs Ladybug X back swimdress is suitable for girls aged 1-6 and has an adorable all-over ladybug and flower print. There is also a cute frill detail and the crossover straps ensure unrestricted freedom of movement. The swimdress is lightweight and durable thanks to a soft-to-touch and quick-drying Elastomax™ fabric that lasts up to 120 pool hours. For more coverage, it features a high back and offers great resistance to chlorine. for submitting product information about Zoggs Ladybug X Back Girls Swimdress We aim to answer all questions within 2-3 days. for submitting product information about Zoggs Ladybug X Back Girls Swimdress. We aim to answer all questions within 2-3 days. If you provided your name and email address, we will email you as soon as the answer is published. Great quality swimsuit, good fit with growing room. for submitting product review about Zoggs Ladybug X Back Girls Swimdress.